The intake manifold is made up of essential components that ensure the proper function of a car. When in use, the manifold gasket keeps the air inside the intake manifold away from the coolant found in the coolant chamber. Since both of them are closely situated, the gasket’s work is extremely important. Without its proper function, the entire combustion process can be in turmoil. If this happens you will witness your car losing performance. Therefore, you need to get the intake manifold gasket repaired as soon as possible, as stalling the repair can cause other engine components to fail and deteriorate. The most frequent failure inside the intake manifold is a blown gasket. Gaskets are made of multiple sheets of steel and sometimes rubber but they are extremely thin, thus under immense pressure, they are susceptible to fail or develop cracks. These flimsy sheets of steel absorb a lot of heat from the engine, so they fail quite easily and affect your car’s performance. Normally, a gasket will live for around 50,000 miles after which it would need to be replaced. The gasket’s life depends a bit on the love and cares you put into maintaining your car. If you are clumsy with this responsibility, the gasket along with other engine parts can have a short life. The most intake manifold gaskets do both separate coolant, air and some cars use the gasket just to not get any intake leaks between the manifold and head. If your car doesn’t have coolant in the intake, forget the coolant part of this article. The main job of an intake manifold gasket is to separate the hot intake air from mingling with the coolant inside the coolant chamber. As soon as the intake gasket goes bad, the coolant from the coolant chamber starts to leak into the intake manifold. The hot air blends in with the coolant and as a result, the coolant heats up and evaporates. This causes a direct effect on the engine as it starts to heat up due to low levels of coolant. Usually, you will see this happening with the rise of the temperature gauge in your dashboard. It is advisable to stop driving your car when this happens. Buy more coolant, fill it up in the radiator and drive straight to the mechanic for a checkup. When the intake manifold gasket goes bad, the intake manifold’s basic function – which is to maintain a perfect fuel to air ratio- is affected. If the ratio is not perfect, combustion does not happen easily and it puts more pressure on the engine to work harder. As a result, more fuel enters the system and burns off. Ultimately, this results in a poor fuel economy and poor engine performance. There will be improper acceleration even when you put the pedal to the metal. The intake manifold gasket’s failure allows all the coolant to leak into the intake manifold. Therefore, all the coolant evaporates from the system. You can probably see the leak near the intake manifold when this happens. Coolant loss will unnecessarily heat up your car and put other engine components in danger. The intake manifold gasket is hidden from plain view. In order to see it, you need to open up the top part of the engine and even then, you are required to be very diligent to spot the gasket. Seeing the difficulty of this operation, it is best to leave all repair work to a professional mechanic. However, there is no harm and skill needed to test and diagnose a failing intake manifold gasket. The first thing you need to do is to look for coolant leaks. The coolant leak can happen anywhere given the number of pipes connected to and from the radiator to the engine. Therefore, it is best to start from the radiator and go onwards to the engine. Most of the time, gravity will be your saviour, as the leaking coolant will drop down to the ground. All you would have to do is bend down and search for leaks. Otherwise, start the car and check for leakage from the pipes. Usually, the first sign of a blown gasket is rising engine temperature. The gasket can break at any moment without you noticing. You will also not hear any sound when it does break, so your first defence against this issue is a proper functioning temperature gauge. If it starts to rise, the first thing you have to do is open up the radiator and check for coolant levels. If the radiator is dry and empty, a gasket could have blown, but then you are not sure which gasket has blown, as there are more than one inside a car’s engine. To be sure, you need to check for leakages near the intake manifold, since they mostly happen when the gasket fails. Ideally, keep your car started when you are testing for leaks. Not all of us are blessed with a mechanic’s mind. Some of us are just too skilled with cars while some of us are not. That’s why we leave the chunk of our work to professionals that know exactly what they are doing. Mechanics own the right tools and mindset needed for a repair of this scale. They charge a hefty amount for their services as well, especially if you are looking gasket failure. 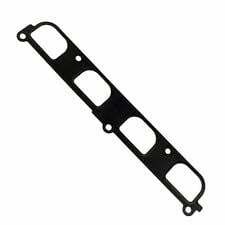 To repair or replace an intake manifold gasket, the mechanic will need to open up the top half of the engine. Expect nothing less than $150- $300 when it comes to labor. The cost of labor will depend on the make and model of your car. If it has a complicated V8 or V12 engine, your mechanic will charge you on the higher side, otherwise, you will be let go relatively cheap. Moreover, it is not actually possible to repair a gasket, as it is practically unrepairable owing to its steel and rubber build, but fear not as they are very cheaply replaced. Typically, your professional mechanic will charge you $80 to $120 for the intake manifold gasket.
. Make sure you choose the right model for your car.